RIO DE JANEIRO — Already one of the most decorated women’s basketball players of all time, Phoenix Mercury guard Diana Taurasi is still breaking records. This time, it was her own. Just two days after tying her own U.S. Olympic mark of five three-pointers made, Taurasi broke that record during Wednesday’s group play victory over Serbia. In the third quarter, Taurasi hit her sixth shot from behind the arc with 8:44 left, setting a new record. In the same game, she also set a new U.S. Olympic mark with 10 three-point attempts. 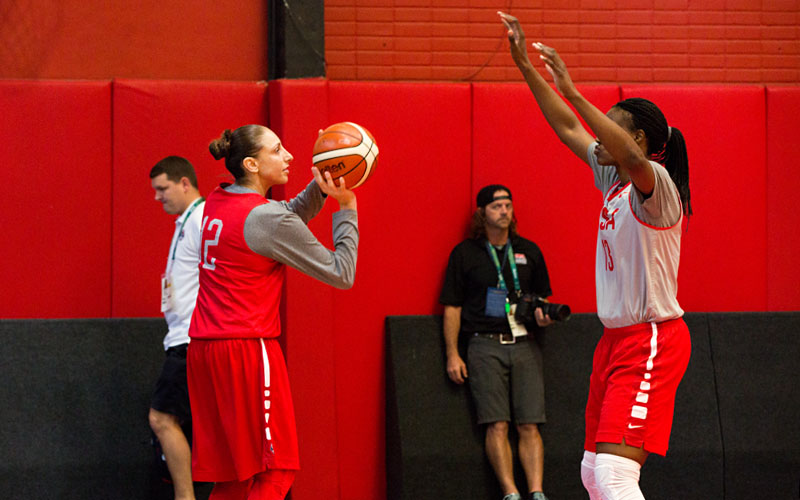 “When I look back on it, you don’t get many opportunities in this game, so the other night I just took advantage of it and it felt good,” Taurasi said after Thursday’s Team USA practice at Flamengo Club. The three-time gold medalist is making her fourth Olympic appearance and has dropped hints that it may be her and fellow University of Connecticut alumnae Sue Bird’s last run at another gold. Bird echoed Taurasi’s sentiments, and added that the duo is also cherishing what could be their last time playing for Geno Auriemma, their former coach at Connecticut who is leading Team USA at the Olympics for the second time here in Rio. The women’s basketball team has a 44-game Olympic winning streak dating back to the bronze medal game at the 1992 Barcelona Olympics. Sue Bird and Diana Taurasi have been a part of the historic run since 2004 in Athens. If the United States wins another gold medal, the two former Connecticut teammates will join Teresa Edwards and Lisa Leslie as the only basketball players, male or female, to ever win four gold medals. If the U.S. men’s team wins gold, Carmelo Anthony would become the first man to join that group. When Auriemma was asked what it’s been like to see Taurasi’s growth since she arrived in Storrs, Connecticut, as a freshman out of Chino, California in 2000, he took a deep breath, and a moment to reflect on the past. The star-studded squad also became the first women’s team to break the 100-point mark in three consecutive games in the Olympics when it scored 110 points in Wednesday’s victory over Serbia. However, Taurasi thinks her team has not peaked just yet.